Finding and removing duplicates in Excel may be a real headache, especially when your worksheets contain thousands of rows. Duplicate Remover for Excel does the job quickly and perfectly – it can find and delete duplicates based on one or several key columns, identify unique values, highlight, copy or move the found entries. Search for duplicates Find absolutely all duplicates in your worksheet, including their first occurrences. Find dupes without 1st occurrences Check your table for duplicate records, excluding their first instances. Dedupe by multiple key columns Check your worksheet for duplicate rows by selecting several key columns. 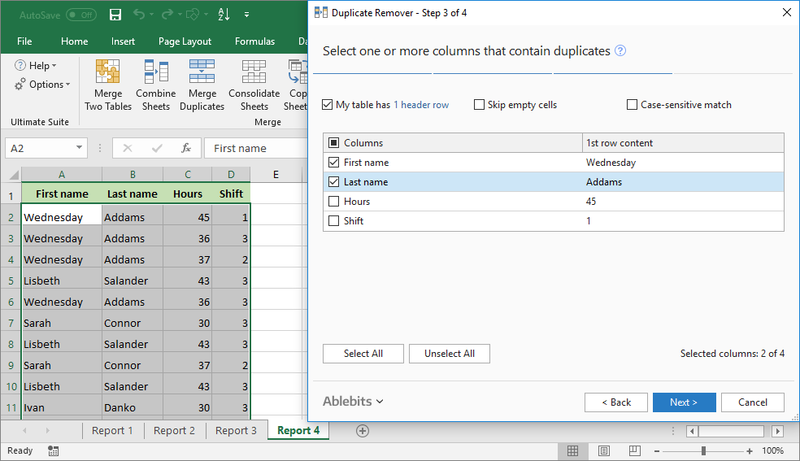 Delete duplicates in Excel Eliminate all duplicate cells or repeated rows in one go. Highlight duplicate and unique values Shade repeated and unique values in any color of your choosing. Check for unique values Use this option to find the entries that appear in your spreadsheet only once. Find uniques + 1st occurrences of dupes Identify all different values in your Excel document to get a list of distinct entries. Identify duplicates in a status column Get a new column with "Unique" or "Duplicate" marks added in each row. 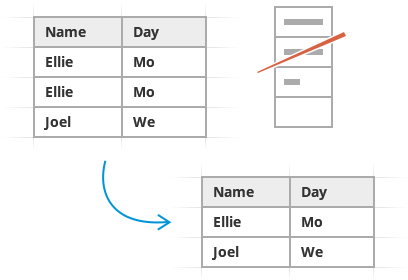 Show duplicates by selecting them Have unique or duplicate cells selected in your table. Move or copy dupes and uniques Copy unique entries or move dupes to a new Excel file. What is Duplicate Remover for Excel? 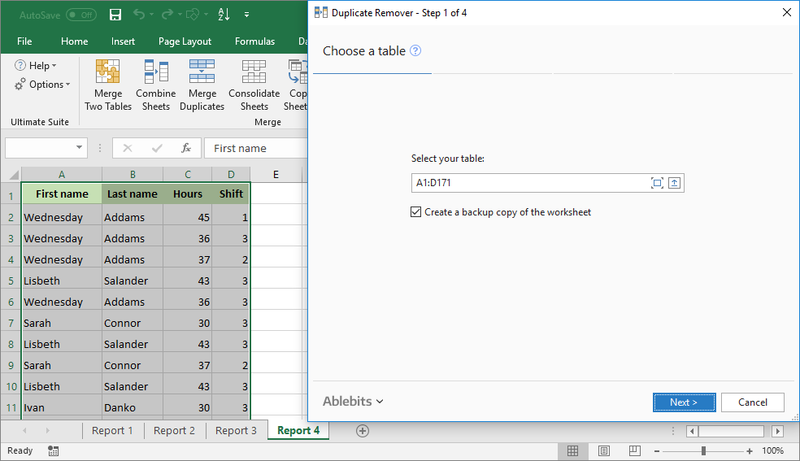 Duplicate Remover for Excel is designed to find duplicates and unique values in one Excel table. 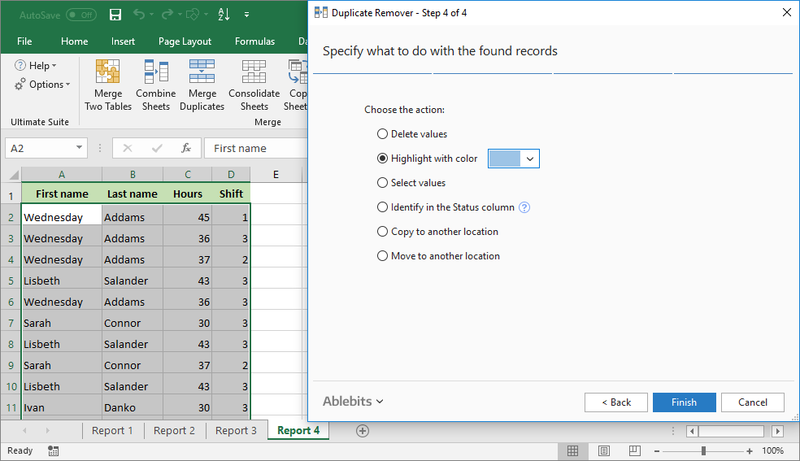 It offers plenty of options to deal with the found entries: delete duplicates, identify dupes and unique values by adding a status column, highlight with any color, select, copy, or move the results to another file or worksheet. Can't I remove duplicates using Excel's built-in features? Our Duplicate Remover add-in offers a wide range of options. It can search for repeated or unique records with or without 1st occurrences. Apart from removing duplicate values and eliminating repeated rows, it can select and highlight them, add a status column, copy or move. How to search for duplicates with or without first occurrences? Select your table or any single cell within it. Duplicates except their first occurrences. All duplicates including the first instances. Select one or more columns to check for duplicate values. Choose the desired action, for example Highlight with color. The detailed step-by-step instructions can be found here. How to check my worksheet for unique and distinct values? Uniques to find only unique values. Uniques + 1st occurrences to find distinct values, i.e. uniques and first instances of repeated values. Is it possible to show duplicates in Excel without removing them? Sure. Don't let the name of the add-in trick you, with Duplicate Remover you can get all the duplicate values automatically selected or highlighted without any actual removals. What if I want to find dupes or uniques and copy them to another worksheet? No problem. You can do with the found values whatever you want: select or highlight them, identify in the status column, copy or move to another file or worksheet. Is there a faster way to deduplicate my Excel tables? Yes, it is. 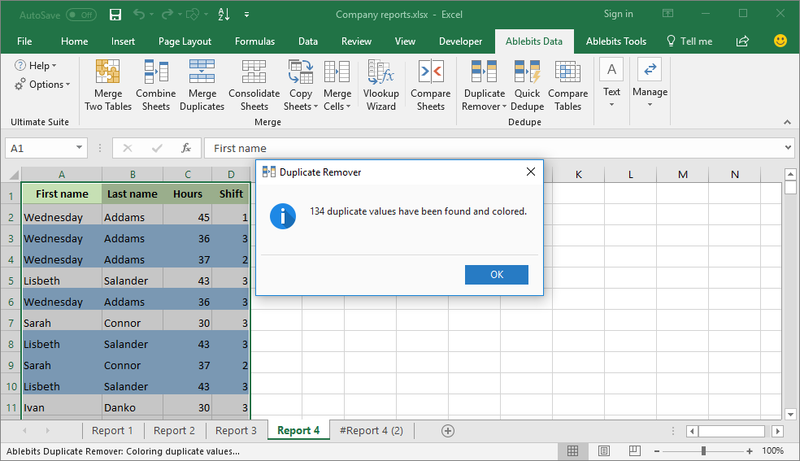 Our Quick Dedupe tool can find and remove duplicates in an Excel table, list or column with a single mouse click.